Hi guys — I’m taking a pause from lifestyle posts today to talk nutrition. With all the buzz surrounding fermented foods recently, most people probably know that there are “good” bacteria out in the world that can benefit our health. But I’ve also had plenty of AnneTheRD nutrition clients say “I know yogurt is nutritious because it has good bacteria, but what does that even mean?! 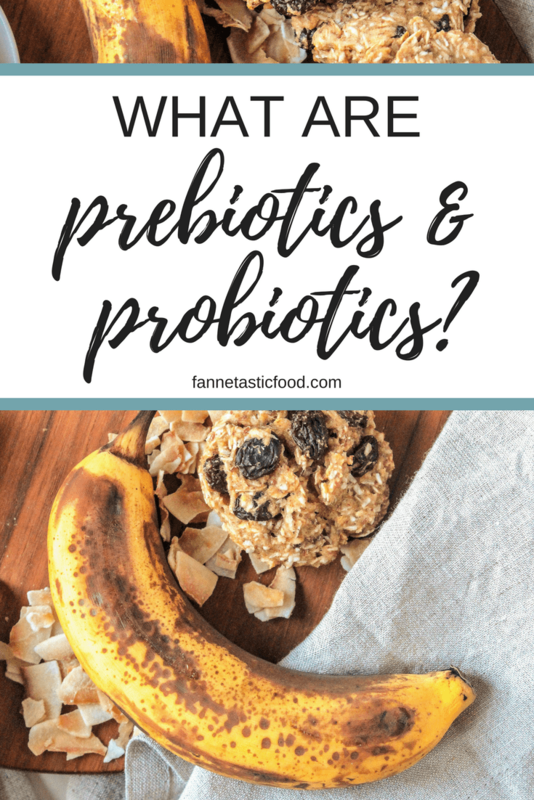 What exactly are prebiotics and probiotics? ?” I hear you, and I thought it would be helpful today to break it down so you can navigate gut health with ease. Here’s everything you need to know about prebiotics and probiotics! Probiotics are living bacteria that are similar to the bacteria in your gut. They’re often called “good” or “beneficial” bacteria because they supplement the bacteria in your gut that works to keep your digestive tract healthy. Since probiotics are living bacteria, they need energy to survive and thrive in your body – and that’s where prebiotics come into play. Prebiotics are a type of fiber that bacteria can ferment to use for energy. Essentially, prebiotics are food for probiotics. Just like all other dietary fiber, our bodies can’t digest prebiotics, so they stay intact throughout most of the digestive tract. Once prebiotic fibers reach the large intestine, where much of our gut bacteria is housed, bacteria ferments the prebiotics to fuel all its beneficial activities. Why are Prebiotics and Probiotics Important? Your gut microbiota, or the community of bacteria living in your gut, plays an important role in your health. Having a “healthy” gut microbiota basically means your gut is an optimal place for lots of different types of beneficial bacteria to live. Since prebiotics provide food for beneficial gut bacteria, eating prebiotic fiber helps make your gut a great home for beneficial bacteria. Your gut is home to about 100 trillion bacteria, and not all of them are beneficial. The overall goal with eating to improve gut health is to help the “good” bacteria outweigh the less helpful bacteria. The best way to increase beneficial bacteria? Eat the beneficial bacteria itself (probiotics!) and supply that beneficial bacteria with the food it needs (prebiotics!). A thriving microbiota is crucial for a healthy immune system. Bacteria in the gut helps control your immune system’s response to intruders by signaling for the release of helper-T cells and cytokines. Probiotic bacteria can also create a physical barrier in the gut to protect against unfriendly intruder bacteria. Eating probiotic foods can also offset imbalances caused by taking antibiotics. When you have a bacterial infection, antibiotics are often prescribed to clear out the harmful bacteria – but they end up also taking a toll on beneficial bacteria in the process. That can lead to digestive distress and diarrhea, but early research has shown that consuming probiotics may help prevent diarrhea associated with antibiotic use. The gut microbiome is currently a hot topic for research, so new studies are coming out frequently that suggest additional benefits of eating probiotics and having a healthy gut. Studies have found probiotics to be beneficial for sleep health, mood, anxiety, and insulin sensitivity. Do you try to incorporate prebiotics and probiotics into your meals? What are your favorite foods for gut health? Supplements are definitely a great way to get in some serious probiotics if getting them from food isn’t quite enough – especially after antibiotics, or with IBS, etc. I hope you feel a difference – GI distress is no fun! Interesting! Fascinating how much we have left to learn about our bodies. Is there any benefit once any of these foods are cooked? (Sourdough bread, yogurt instead of milk in baked goods, that sort of thing?) I know the cultures die off, but wonder if any benefits are preserved. As far as future topics, I’d be really interested to hear your thoughts on protein intake, particularly for active women. I have a few friends who are really enthusiastic about macro counting and super high protein consumption to support weight lifting goals, but I kind of wonder if it isn’t redundant past a certain point. Apologies if you’ve addressed this before and I’ve missed it! Oh yes, I’d love to hear about protein! I really think I eat more than I used to once I began practicing Intuitive Eating and quit restricting. (Plus working in dialysis and talking to my patients all. the. time. about it has subconsciously made me more aware.) That said, I really feel like some days, without counting, it seems I’m getting more than 0.8-1.0 g protein/kg of body weight. So I find that protein supplements are often unnecessary. But I would appreciate your insight on this, Anne! Good question! In terms of probiotics, if they are heated, like yogurt being added to a baked good, they will be killed off unfortunately. Although you still get the protein and other nutrients from the yogurt. But, if you want the probiotics, best to eat it un-heated! In terms of sourdough bread, the probiotics will also be killed off during heating; that said, sourdough bread can be easier to digest due to the inclusion of those probiotics in the starter. The probiotics produce lactic acid, which breaks down anti-nutrients like phytic acid (which can block mineral absorption); they also help the bread to rise without yeast. So, still useful, but not technically a probiotic food once cooked. :) And thank you for the protein intake question – I’ll add that to my list! I would love to see a post about how to ensure a healthy vegetarian diet! Great idea – thanks! Will add it to my list. I second a post on a healthy vegetarian diet! Cool, adding to my list! Well this was fascinating. I understand about probiotics but had no clue about prebiotics, thank you! Curious about the above question – when they are baked do you lose those benefits? Absolutely! 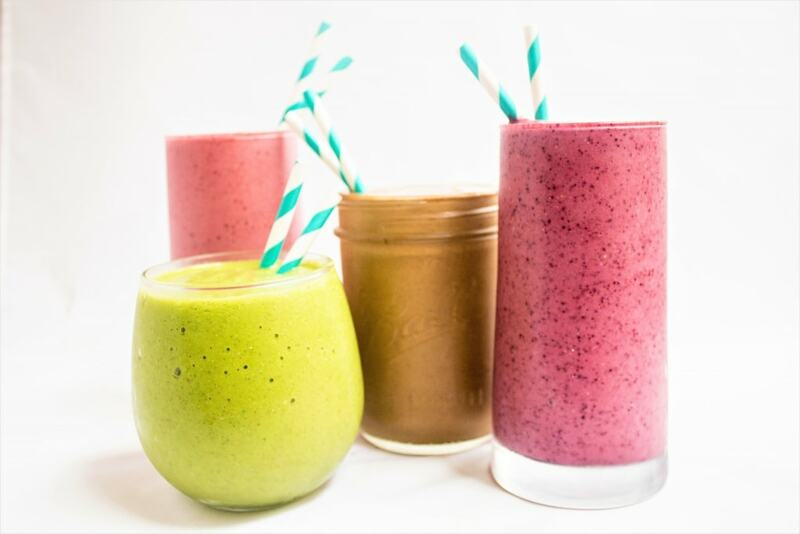 We love getting our probiotics and prebiotics on a daily basis for a healthy gut, via various fruits and veggies and fermented food and drinks. We are big on making homemade ferments to allow for the most beneficial bacteria to stay in the food. One thing to consider when buying ferments at the store is if the ferment has bacteria added in or if it is raw/wild. We recommend the raw options, as they contain far more beneficial bacteria, which helps strengthen the gut even more! Great post and thanks for writing it, not enough people are talking about pro and prebiotics…but it is changing. That’s a great tip about raw vs. added bacteria, thank you for sharing! I’d love to get thoughts on protein intake and supplements. I don’t don’t trust a lot of the supplements/powders and a recent study I saw found the ingredients in many on the market are full of pesticides. I’d love to hear your thoughts on all the protein laced products out there. Good question – I’ll add this to my list. That’s interesting about the pesticide research – yikes! Along with protein, I’d like to get your take on collagen supplements. So many people seem to be using the powders these days and I wonder if they help, hurt, or do nothing. Good question! Matt was taking a collagen supplement for awhile because apparently it can help with lyme disease, but I will add this to my list to look into a bit more! Thankyou for this very informative post! It really helped me know more about probiotics! Kefir has been a favorite of mine for the past year or so! We even provide it to our patients at the hospital taking broad-spectrum antibiotics! I’ve actually never really had kefir myself – I need to try it! That’s a great idea to give it to hospital patients – I bet it helps so much to counteract the GI issues that can come from taking antibiotics! p.s. How do you have Kefir usually? Plain or with something else? This is a great break down, thanks for sharing! Would love to know your thoughts on infant probiotics! Just started my infant (3 mo) on Evivo, designed to work with breast milk to help babies get gut bacteria that 90% of modern babies are missing due to antibiotics, cesareans, etc. We’re only on day 4 or 5 but are liking so far! My thoughts are I don’t know much about them to be honest! It sounds like a good idea – I wonder if breast milk contains a version of probiotics? Interesting! Have you noticed any differences in your baby’s digestion or anything? Very concise post!! Probiotics is very helpful to maintain our body’s balance of good and bad bacteria, which keeps our digestive system, and our body, working the way it should.